Recently I received some great cards and info from Noelene. I love discovering clubs and really appreciate everyone posting their stories on going out. If you are interested in being a part of this project, please do! Can you include years and addresses so I can pin point when the club existed and where it was. Without this I can’t add it to our club list. As for the club list, I have had such a great response I will be totally revising it soon. Promise. When you do list a club I do have to check via archives and library research which does take time. This is what Noelene sent through: First club I went to was Rebeccas it was in the basement of a building that now is occupied by Commonwealth bank in Edward Street. The entry door as I recall was about a metre from the laneway that is still there and bounds the Rowes Building. There was another club downstairs in Rowes arcade. I think it had a spiral staircase and was called Rowes or Roses Wine Bar ??? (ed I think it was Old Roses – can anyone confirm?) 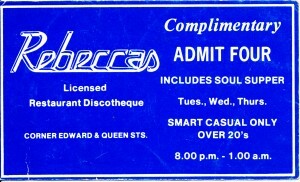 Licence laws meant that meals had to be served with the ticket price.Rebeccas had a rib fillet and salad deal. The steak was very thin as I recall. The laneway was the scene of much boy/girl action and drugs, but I just recall seeing marijuana and pills. The first night I was there was late in 1977 I think it was November and we called in after Rod Stewart’s concert at Festival Hall. I worked there at lunchtime as a waitress. One of the part owners, Lez Zeilin was Polish and his Mother worked in the kitchen making traditional Polish food. Surprisingly for such a dive of a place that Polish food was made with love and care and tasted fantastic. I still remember how different that place looked in the daytime, although being in the basement it wasn’t exactly bright. Charlie Browns wine bar was also popular, it was downstairs just around the corner of Albert Street in QUEEN Street. Think there is a phone shop or ANZ bank there now. Suspect that the downstairs part of JB Hi Fi formed part of it. 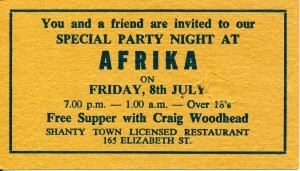 Afrika in Elizabeth Street became popular, I think it may have preceded Rebeccas but I’m not sure, my first husband worked there and on the back of the entry card he has written me a note from when he lived at Annerley. Thats why I think it was early days. The guys (Gerry Harrington and Les Zeilin) had leased the site that became the Atcherley. Awful place, what were they thinking, I remember going there with them to see if it could become the next hot spot. They went ahead and I recall being there on the opening night but can’t recall ever going back. After Whispers in the Valley, much later, probably 1983/84 was The Brisbane Underground in Caxton Street. That place was my last experience of clubs. Anyway, enjoy the cards…Boogie Wonderland just started playing in my head. Thanks Noelene for your stories and your cards. If you have something you’d like to contribute, let me know. This entry was posted in 1970's, 1980's, Clubbed Out, Clubs. Bookmark the permalink. Wasn’t that place downsatirs in the Rowes Arcade was called Rosie’s? I’m pretty sure that’s what it was called in the late 80′s early 90′s anyway. After finding this site, I pulled out an old box of junk I had at home and after making much mess I found a small flyer for Iggy Pop appearing at Whispers on 10th July 1983.. (special guests The New Christs and Les Bon Bons?). Also found some unused “Tracks” free entry passes, a blank reciept for something at the “Terminus Cabaret Disco Restaurant” on 18 Nov. 1983. A ticket stub for David Bowie at Lang Park 1983. A “Hollywood Trade Members Card” (81 Elizabeth Street – Free Admission for bearer), but it’s in particularly poor condition..
A sticker from Environfest at Samford 1983 (Split Enz, Goanna, Partboys, Gold Rush, Barry Charles, Big Red, Speakeasy, Posh). A ticket stub from Cold Chisels Last Stand at Festival Hall. Damn, I had no idea I still had this stuff!! hold onto all of it! I’d love to use it for our exhibition and book too. The club downstairs was called Old Rowes. Neil McLucas (current owner of the Sportsman Hotel in Spring Hill) was one of the partners I believe. There is some Old Rowes memorabilia up on the wall at Sporties. It was definitely Rosies, spent many a night there. The name Rosie’s came later. It was originally Rowe’s Restaurant, hence just called Rowe’s. It lasted until the original Rowe’s Arcade closed for refurbishment. The entrance and staircase in the arcade had disappeared with the rebuilding. 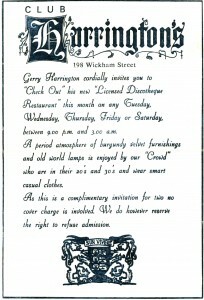 Worked for Gerry Harrington back in 82/83 when he owned Knights Bistro, downstairs, in Elizabeth St. Drove his 4BC Space Invader Bus. Johnny O’Keefe played at the opening of the Lands Office pub in early 1971 to a packed house. He was on tour to Townsville and Darwin at the time after doing several gig’s at the Chevron in Surfers Paradise. Australia’s first & best rock star!